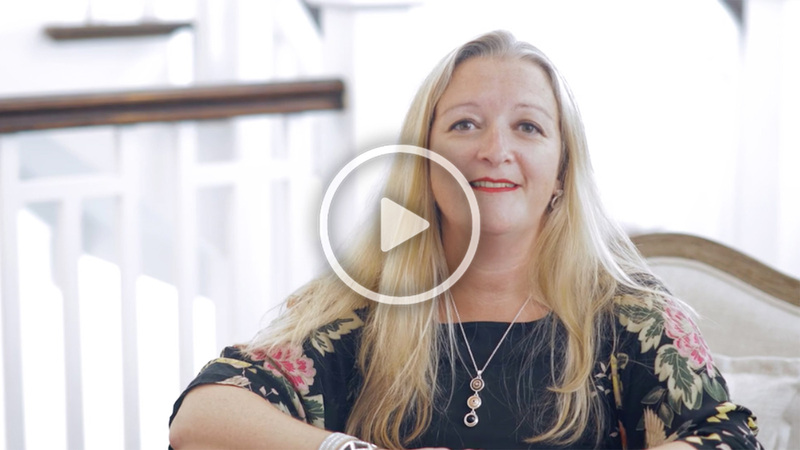 To keep you "on trend" this season with the latest style inspiration, Claire, our Director of Design and fashion professional, has selected some great combinations to accessorize your Fall fashion wardrobe. 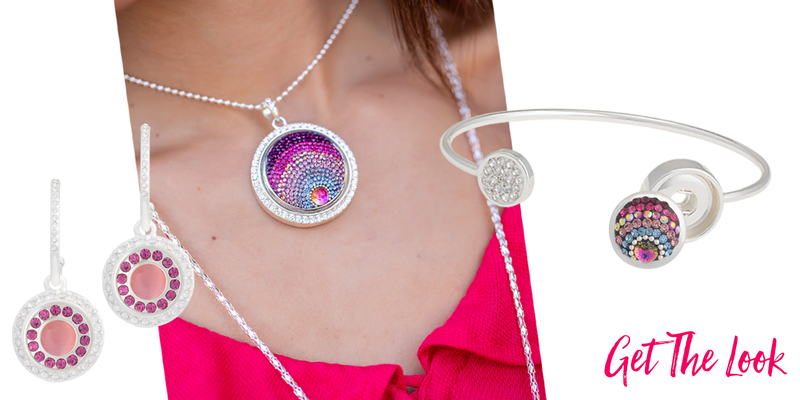 Whether it is a special gift or a treat for yourself, Style Dots has the perfect jewelry set for you. Want a look that’s both sophisticated and trendsetting? Then our shiny and textured Forged line was created just for you. 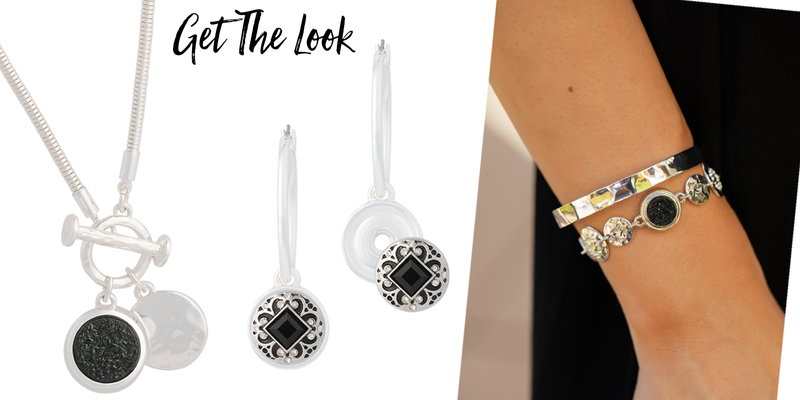 Pair with Classic Hoop Earrings and dramatic black Dots to show off your superb sense of style. We’ve combined red Dots in a variety of shapes, sizes and finishes to create this striking set. The clear crystals in the earrings lighten up the effect and highlight matching crystals in the red Dots for a perfectly lovely look. Sure to get noticed anywhere, our bright fuchsia Dots look most striking in these gleaming silver foundations. Added details such as chain tassel, hammer disc and lots of bling create a look designed to dazzle! 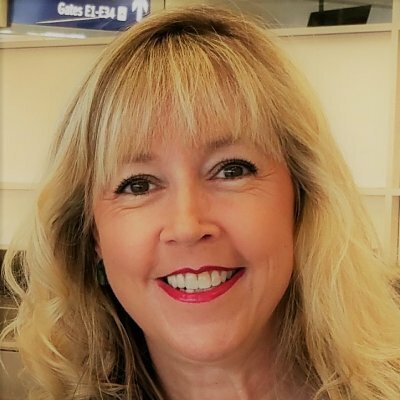 Want jewelry that fits your lifestyle? 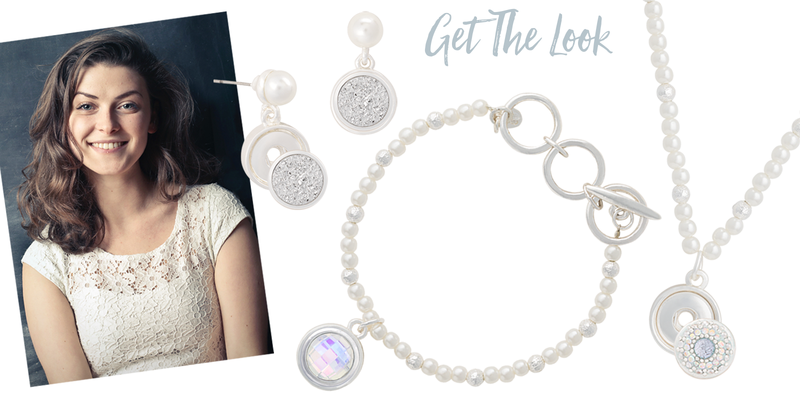 Take our Pearl Collection and dress it up or make it casual depending on the Dots you choose! When you swap out the Dots to suit any occasion, you’ll create the perfect look! Shades of green have long been associated with nature, renewal and life and our green Dots certainly bring life to any foundation you choose to wear. Plus, the silver foundations show off these fanciful Dots to their best advantage! 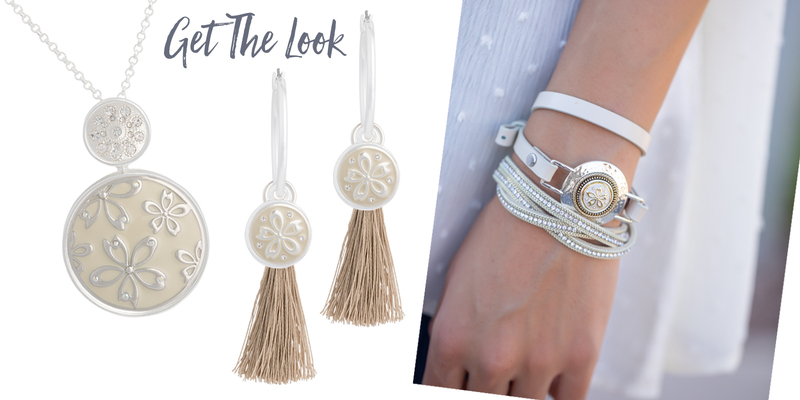 A breezy and beautiful look is created when we combine cream-colored Dots, tassels and bling with our luscious leather bracelets and Classic Combination Necklace; the perfect set to add light up any outfit! 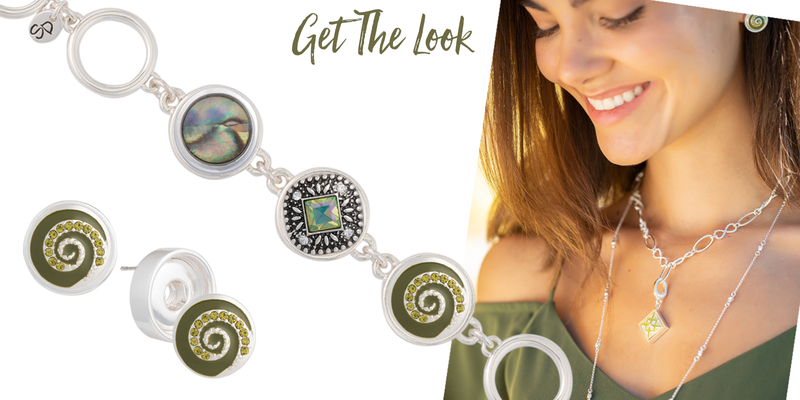 We’ve captured some of the bright and very welcome shades of early spring in this collection that let you update your jewelry to match the new season. 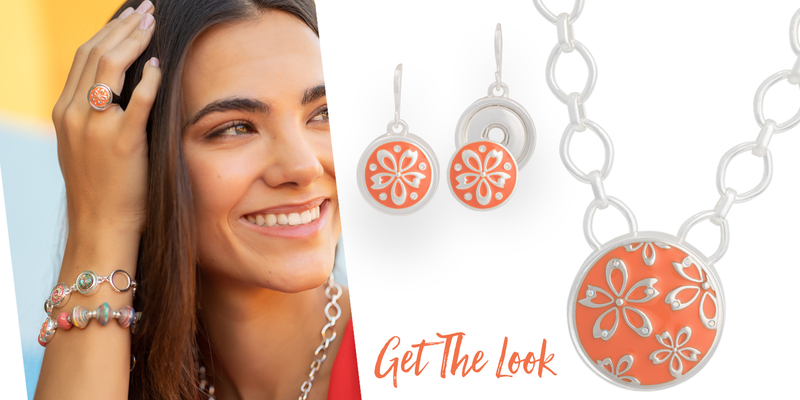 Wear these cheerful selections and let your colors shine! What an upscale look! Glamourous gold and sparkling crystals are always a classy combination. 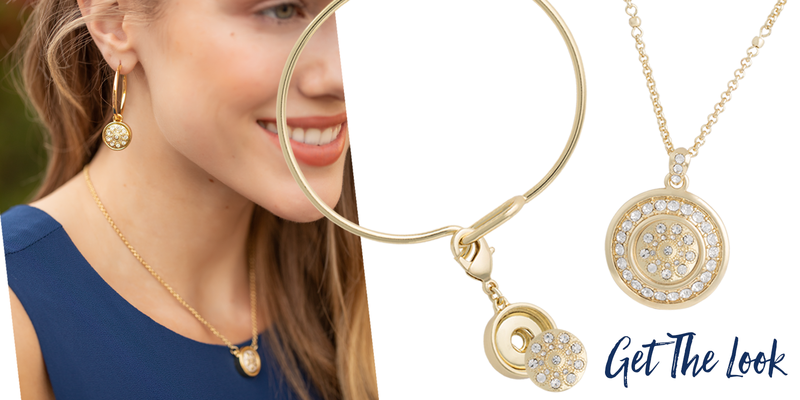 The slender Bangle Bracelet, earrings and necklace all match to give you a most refined appearance. Azure, navy, royal and sky blue are so appealing on their own, but even more delectable together! This set is a must-have if you love blues and want a look that is tantalizing! Bright and breezy sums up this youthful look. With large oval crystals dangling from the earrings and the ends of the bolero-style necklace, every movement will catch the light and reflect it back in sparkling rays. Shiny silver and sparkling bling form the ultimate backdrop for our festive fuchsia Dots. Reach for this set when you want to add a rosy glow to your ensemble. 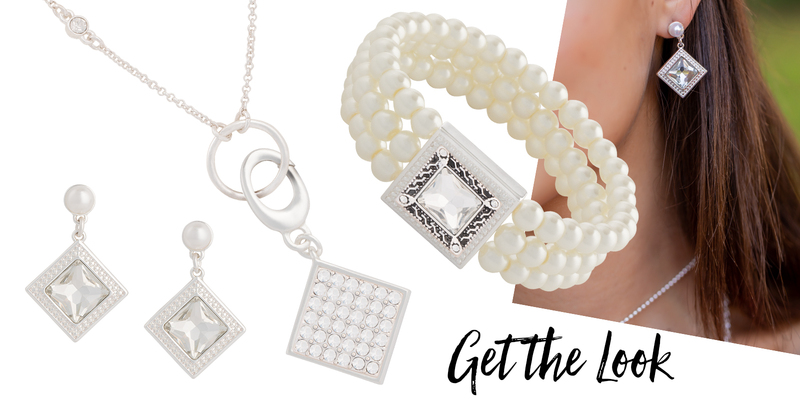 Diamonds and Pearls are always a great combination, so take inspiration from our combination of Pearl Foundation Pieces with Diamond effect Style Square Dots.